Postscript: During this past week at my church’s Arts Camp, all of the children, and some of the teachers, created kindness rocks. The photos are only a small sampling of their joyful work. 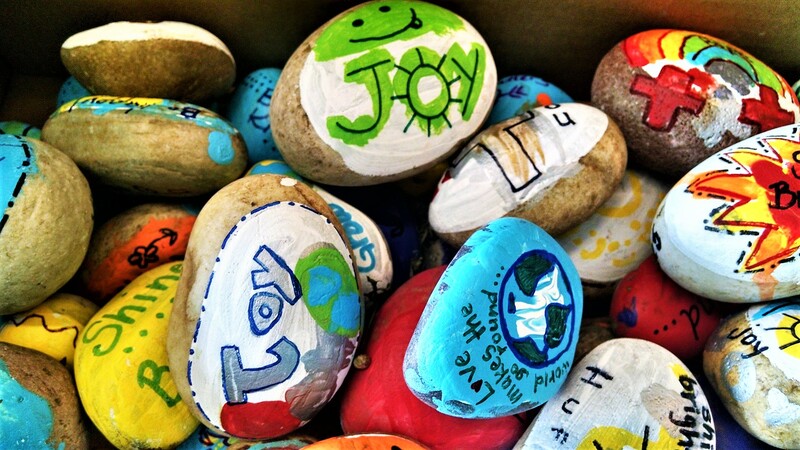 I hope to see a few of these rocks out in the community…the kids did a great job! 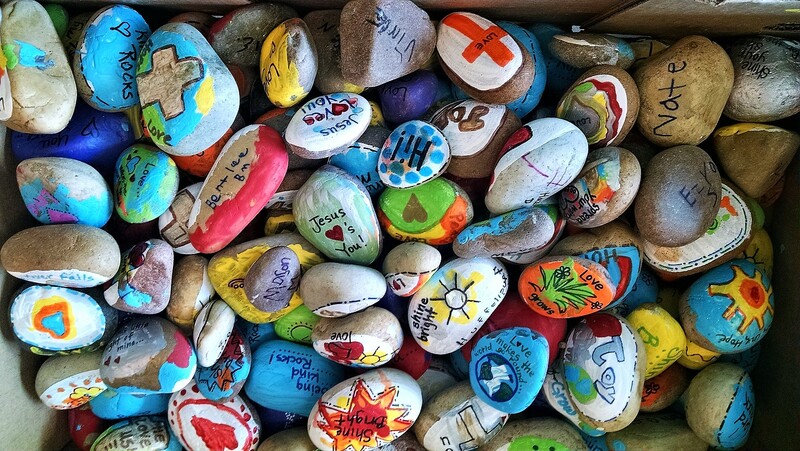 Kindness rocks….what a great idea. It really is. I am hoping to have time to create a few kindness rocks for next summer, when I can leave them on the bike trails. It’s all about making people smile and letting them know they are valued. This is a great project for both adults and children. One can’t help but feel happy when painting rocks with messages of kindness. I hope they find good homes. The rock garden is a fabulous idea! I could see that as a project for the community or a botanical garden. It would be a delight! That’s beautiful! Everything about this is beautiful! Sharing love is the best way to feel love. Beautiful art! There was so much love and beauty in the rocks. Wish I could have photographed them all. Beautiful poem and I love those rocks! Do they give them away to people or place them around the community for others to find and/or admire? The kids are supposed to place them around the community for others to find, but I suspect some may want to give their rocks to mom, dad, a best friend or other relative. Either way, it still sends a positive message. I love the idea of kindness rocks! How wonderful ❤️ Lifts my spirits after such a crappy last couple of weeks. I’m glad that the rocks brought you a little Ray of sunshine and kindness. They seem to do the job even when it’s virtually. It’s a wonderful thing that you do! Thanks for adding more kindness to the world. Great idea. Paint kindness rocks and give them away to random people. Poem was good too. Linda Hill will be appreciative of your visit! That’s a fantastic activity 🙂 I’m so glad all this cheer and hope is going out into the world. Ohhhhh Mary! I LOVE this post. I adore the stones, and the effort behind the making of them. They’re just perfect. Thank you also for the poem. I hadn’t read that before … is it one of your own? It’s totally perfect. 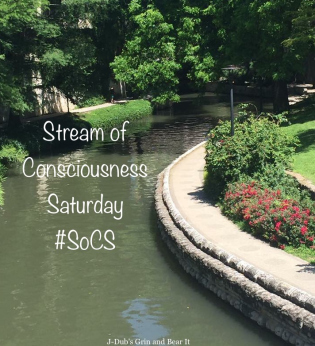 Yes, the poetry is my own…responding to the SoCS challenge and imparting the loveliness of the rocks. Thanks for your kind comment!